Wasting electricity is nothing new. I have a recurring earworm originating in a 1970's Ontario Hydro advertising campaign; "wasting electricity turns people off." In the decades since we are often reminded we use the wrong light bulb, the phone charger wrongly, water stupidly, and on and on. But today's waste includes actually curtailing emissions-free generation, without consumer savings, simply because there aren't consumers that can use the electricity. Much of that waste is avoiding generation from the public hydro-electric generation that gave the former public utility the name "Ontario Hydro." 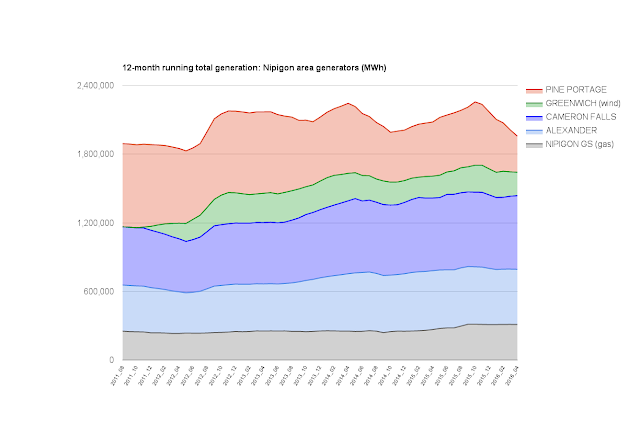 Ontario Hydro is gone, but it's generators survive under Ontario Power Generation (OPG). I present OPG's generators on the Nipigon river as an example of the waste occurring in today's IESO administered electricity system. The Nipigon river was in the news this winter as a new and unique, to the climate, cable-stayed bridge heaved, closing the TransCanada highway to all traffic for days, and requiring heaving loads to drive around Lake Superior for a much longer period. The bridge design was selected, at least in part, as it "eliminates the need for in-water structures in the Nipigon River." 15 kilometers (km) away, the Alexander Generating Station is an in-water structure that first started producing power in 1930. The current capacity is 69 megawatts (MW). 2 km upriver of that is the older Cameron Falls Generating Station, with a capacity of 92 MW. Forgan Lake, south of Lake Nipigon, was created when Pine Portage was built. Forgan Lake was named by a decision of the Canadian Board of Geographic names on November 3, 1949. The lake comprises Hannah Lake and Creek, Eva Lake, Pine Point, Devil Rapids, Victoria Rapids, Emma Lake and others. Conceptually, the same water provides electrical power 3 times, with it's journey through all three generators controlled at Pine Portage. 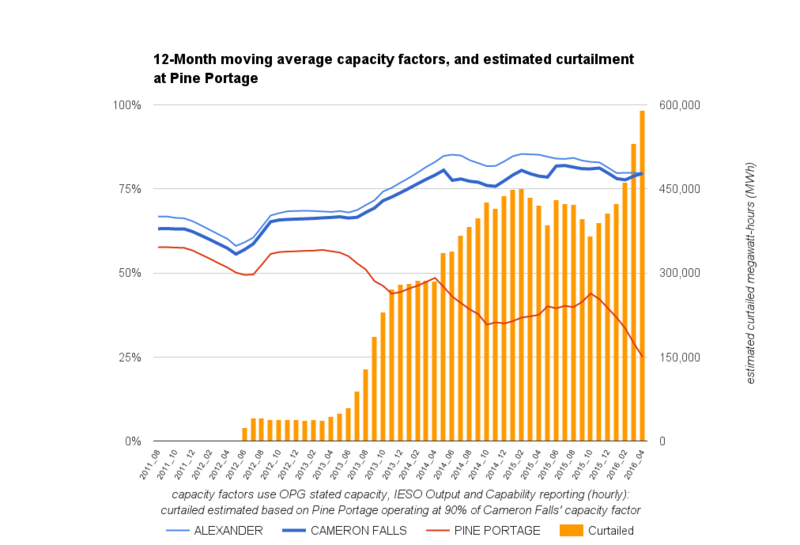 The decline of production at the Pine Portage generating station is obvious, and so dramatic in recent months I asked OPG on twitter if they, "would like to comment on reduced production at Pine Portage GS before I speculate." OPG responded, "Pine Portage GS is available to run if required. Suggest you contact @IESO_Tweets for demand information." Hopefully somebody at the IESO still reads my work, but not anticipating any transparency from the IESO on wasting water, I've gone ahead and estimated how much clean electricity supply is being avoided on the Nipigon river. The first graphic showed generation totals. To estimate losses I've looked a capacity factors (the total generated divided by theoretical total if the unit generated at 100% of capacity at all times). The two lower generating stations are similar, with Cameron Falls producing at slightly lower levels than Alexander. Pine Portage, in the first year of data, produced at a capacity factor (58%) that was approximated 90% of Cameron Falls (63%). The level of Lake Superior has risen very significantly over the time period I've captured data, and improving output at Alexander and Cameron Falls supports my assumption water levels have improved on the Nipigon river as well. With good evidence production should be higher than during my first 12 months of data (starting September 2010), I've not used that period as a baseline of what Pine Portage could have output, but instead calculated potential production at a capacity factor that is 90% of the capacity factor achieved at Cameron Falls. The explanation isn't nearly as important as the soaring curtailment that is evident. 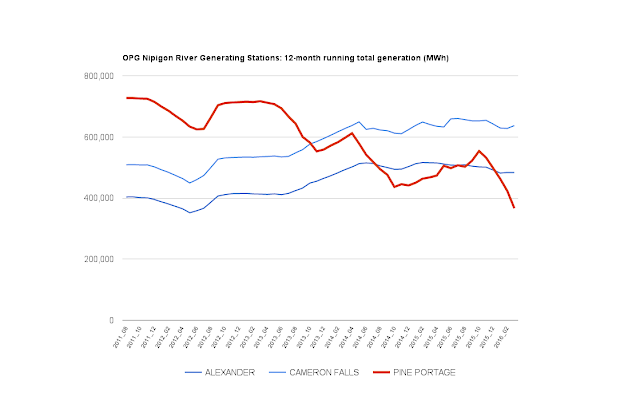 Curtailment of OPG hydro on the Nipigon river is around 600,000 megawatt-hours over the past 12 months. In current jargon units, enough to to power over 66,666.666....households. This is but one method of seeing it's bad. 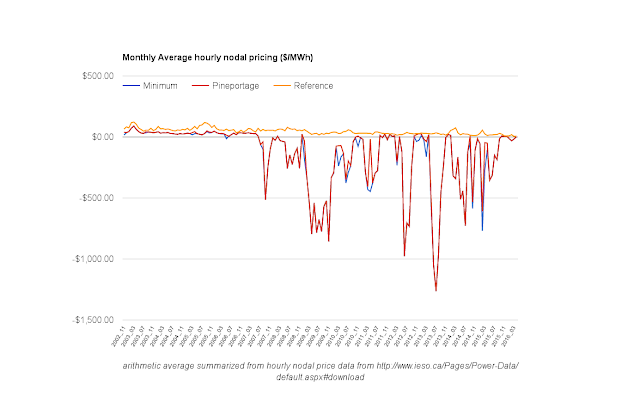 The IESO provides hourly "nodal" pricing and the Pine Portage node has been the lowest price node most months since market data began. Since the summer of 2007 the average rate for that node has generally been far below zero. Despite negative rates and obvious congestion, the province added industrial wind turbines to the area, with the first power delivered from the Greenwich location in July 2011. Adding Greenwich wind, and including the existing natural gas-fired Nipigon Generating Station (Nipigon GS), reveals total production in this small region was about the same in the past 12 months as the 12 months prior to Greenwich entering service. While the output has been slightly higher at times, it doesn't appear any of Greenwich's output has done anything but displace legacy public hydro power that would have cost consumers a fraction of the price. The Nipigon GS merits a short note because it is apparent it runs essentially as baseload power despite being powered by natural gas. The plant is one of Ontario's expensive non-utility generators (NUGs) with contracts dating back to the governments of Liberal David Peterson and New Democrat Bob Rae (who would later become a Liberal). 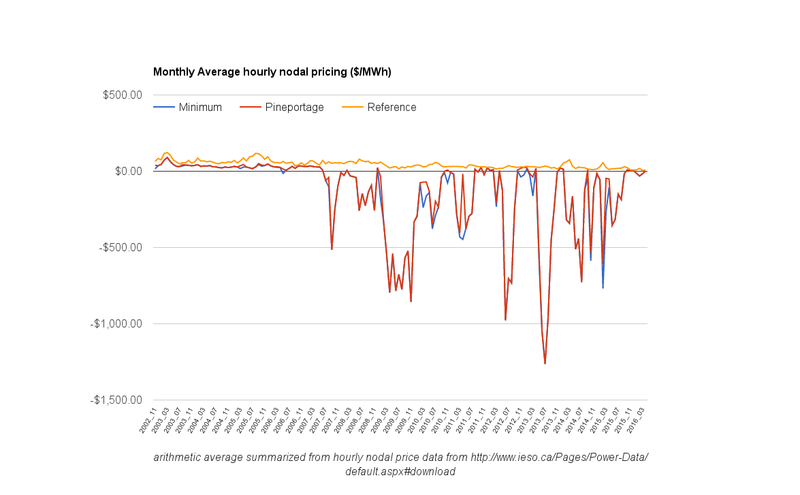 While the location was not one noted in the lawsuit I recently wrote on, this small group of generators does display that NUGs and new intermittent generation from wind and solar are driving up pricing, largely from excess production that must be curtailed or dumped. The courts have ruled this increase in costs should further increase payout to NUGs, thus driving consumer rates even higher. The Nipigon GS is connected to the TransCanada Mainline, and there is an efficiency as it utilizes "steam produced from the hot exhaust gases from the two nearby TransCanada Mainline gas transmission compressor station turbines." From Nipigon the TransCanada Mainline heads north with Highway 11, leaving communities near the north shore of Lake Superior but east of Nipigon without natural gas service.. The Ontario Energy Board (OEB) is currently holding hearings on expanded natural gas distribution in the province. I have not located any information to suggest either OPG nor the electricity system operator (IESO) has intervened in those hearings. However, a bulletin from Ontario's Ministry of Northern Development and Mines has been entered as an exhibit at the OEB, on funding communities east of Nipigon to "explore the benefits of converting to natural gas by investing in a feasibility study." I would suggest if either OPG or the IESO had an interest in the value propositions of their products/services, they might be interested. An "East-West Tie Line" has been planned to strengthen the electricity transmission system between Wawa and Thunder Bay (an area including Nipigon). According to the IESO "The new line will increase the electricity transfer capability into Northwest Ontario from 175 MW to 650 MW...This project is planned to be in-service in 2020." According the OEB, "In March 2011, the Minister of Energy asked the OEB to create a process for selecting the most qualified and cost-effective transmission company to develop the East-West Tie transmission line..."
It appears to me the OEB, at the direction of the government, is now holding talks on how to fund stranding the electricity assets requested by the government in order to increase natural gas distribution at the request of the same government. In these discussions nobody is mentioning 600,000 megawatt-hours of waste on the Nipigon river primarily because the IESO doesn't disclose any information on the curtailment of hydroelectricity suppliers. Leaving everybody, including judges and regulators, operating in ignorance is not, in my opinion, the proper way to operate an electricity system.